I've been wanting to read Chris Abani's novels for the longest time and I was finally able to do so the other day. 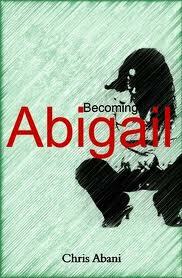 Becoming Abigail is Abani's second novella and it really does say a lot for being so short (around 113 pages). It may be a really quick read, but it wasn't an easy read. Becoming Abigail tells the story of Abigail, a young girl from Nigeria whose mother, also known as Abigail, died at childbirth. The novella has two strands, 'Now' and 'Then', through which Abani tells a terribly, haunting story. 'Then' shows Abigail remembering her life in Nigeria. Her father's depression after losing his wife, Abigail being sexually abused by male relatives and at 14 her father, thinking he was helping Abigail improve her life, asking her cousin (through marriage) Peter, to take her back with him to England. Her move to England, which was meant to be the beginning of a new life, led to only more abuse. She eventually meets a man, Derek, who sees her for who she is, but even that leads to tragedy. 'Now' sees Abigail on a crisp night 'gazing out at the dark cold presence of the Thames' unable to bear it all. It may be short, but this novella does say a lot. It wasn't easy for me to read, but Abani is such a beautiful writer, and as I read his words I could tell he was a beautiful poet. He makes it possible to want to continue reading such a sad story. This is a powerful book, and despite the sadness behind it, I would still recommend it.